By any yardstick, the Room Mate Hotels group is having an unusually busy March. In addition to the banner opening of the Patricia Urquiola-designed Room Mate Giulia in Milan, within a finger’s reach of the Piazza del Duomo, it is simultaneously opening Room Mate Valeria in Malaga. 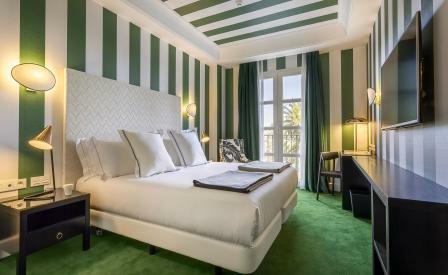 Just a short walk to the marina, the 61-room hotel is the third outpost in Malaga – evidence enough of the group’s bullish outlook for the city. The junior rooms are on the small side, though interior designers Melian Randolph have wielded a smart palette of bright bold striped wallpaper in turquoise and navy, tall drapes, and subway-tiles and white marble floors in the bathrooms to great camouflaging effect. In the public spaces, all framed by high windows, botanical prints reference the picturesque fringed gardens of the nearby Paseo del Parque to the hotel’s north-east, while the cobblestoned courtyards, rattan furniture, metal lanterns and yellow glazed pots remind you of the area’s rich Andalusian influences. Meanwhile, the rooftop pool with views of the marina and the sea whets the appetite for more – the group is all set for another ten openings this year across Spain and greater Europe including Rome, Florence and Barcelona. Consider us duly impressed.